Nettles are a traditional springtime food wherever they grow. There is a reason for this. Despite their ferocious stingers, stinging nettles are incredibly high in vitamins C, D, iron, potassium, manganese, and calcium. Nettles are unusually high in protein for a green plant, and are usually pretty common in cool, wet weather. Many, many cultures turn to nettles to break the nutritional privations of winter, when few green things are available. This is what happened in Italy’s alpine regions, among other places. 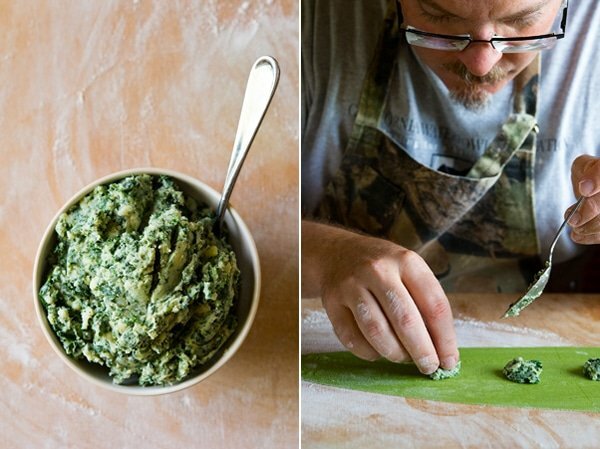 This recipe is a mashup of two traditional Italian nettle pastas. The pasta itself is a nettle pasta, which when cut into linguini-like strands is called strettine. The filling is from the far north of Italy, Alto Adige and Trentino. It’s surprisingly like an Irish colcannon: mashed potatoes with minced nettles — plus a healthy bit of mascarpone cheese to make it Italian. 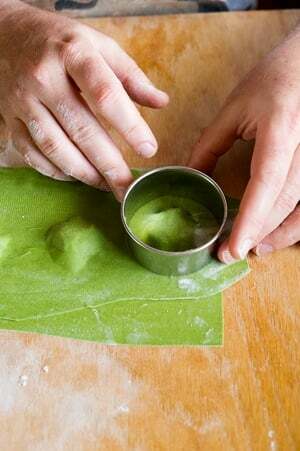 Step by step instructions on making the nettle pasta are here. 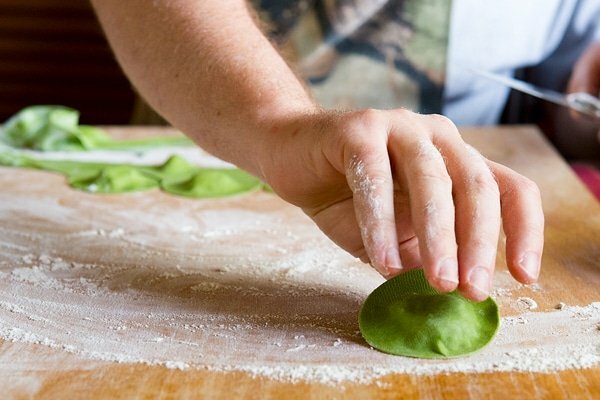 Here’s how to make the raviolis themselves. This is a bit of a project. 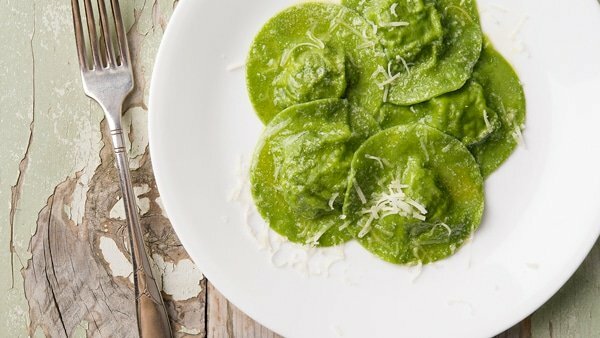 While it doesn’t take that long, the process of making the pasta and then the ravioli requires a few hours — too much for a weeknight. But once you make them, you can freeze the ravioli for later in the week. To properly do this, arrange the finished, uncooked ravioli on a baking sheet that has been dusted with semolina or cornmeal. Put the baking sheet into the freezer. When the ravioli have frozen solid, about 2 hours, you can move them to a freezer bag and store that way. They will keep for about 2 months; after that, they get brittle. 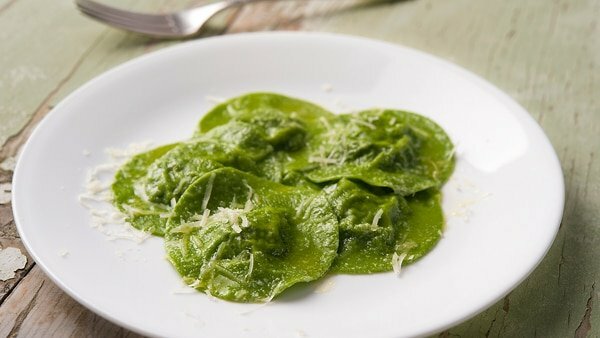 Serve these ravioli with simple, high-quality butter, fresh ground black pepper and some grated dry cheese. A Tocai Friulano or other big white wine would be an ideal accompaniment. You will want to start the process by making the pasta. Instructions for doing so are here. While the pasta dough is resting, make the filling. 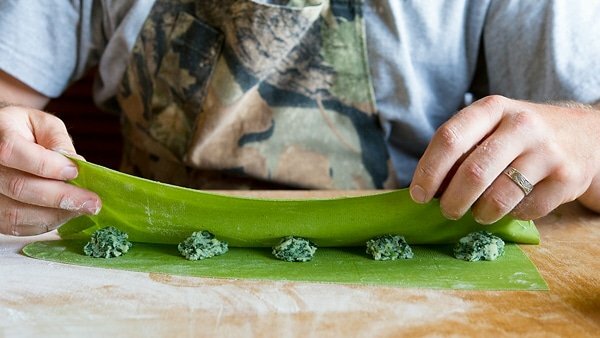 To make the filling, you will need two or three big tong-fulls of fresh nettles to get your 4 ounces. I say tong-fulls because you do not want to pick up fresh nettles, as they will sting you. Thus the name. Get a large pot of water boiling and add a handful of salt. Grab the nettles with tongs and put them into the boiling water. Stir around and boil for 1-3 minutes, depending on how old the nettles are. Fish them out with a skimmer or the tongs and immediately dump them into a big bowl with ice water in it. Once they are cool, put them in a colander to strain. Get a cloth towel, like a tea towel, and put the nettles in it. Wrap one end of the towel one way, then the other end of the towel the other and squeeze out as much moisture as you can. Chop the nettles finely — don’t use a food processor or you will get a mush. In a bowl, mash the potatoes, mascarpone and nettles into a cohesive paste. Again, not a food processor! Do this by hand, as it is important for the texture. Taste it and add salt and pepper to your liking. If you want, a little nutmeg is good, too. Roll out your pasta dough. Cut the dough ball into 4 to 6 equal pieces. Keep each piece covered in plastic or under a tea towel until you need it. 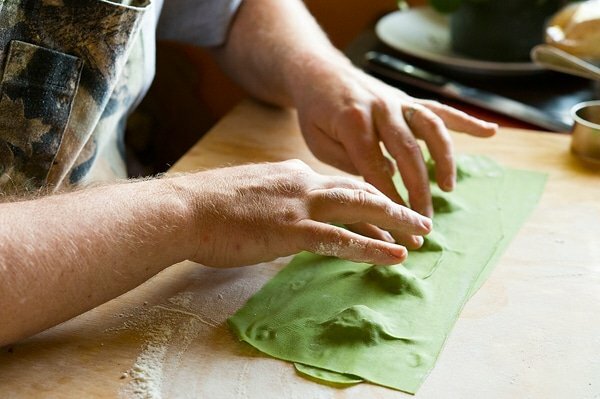 Using a pasta maker, roll the dough into long sheets at least 2 inches wide. Roll them very thin: I go to No. 8, which is the second-thinnest on my Atlas. Lay the sheets down on a work surface (I use a large maple board) and place about a heaping teaspoon of filling on each one, at least 2 inches apart. Cover them with another piece of the dough. As you are laying the second piece of dough down, carefully press it to remove any trapped air. Start from one end of the sheet and work toward the other. It takes practice to do this seamlessly, and I don’t always get every raviolo right. Cut each raviolo out with a circle cutter or a wineglass. Of course, you can also use a standard ravioli mold or cut them into squares with a ravioli cutter. When each raviolo is finished, lay it out on a well floured board to dry a bit. Repeat this with the rest of the dough. You can let the ravioli sit out for a couple hours, but for more than that you should refrigerate them. Don’t refrigerate for more than 8 hours, though, or the filling will destroy the ravioli. If you need to store them for any length of time, freeze them according to the instructions above. To cook the ravioli, bring a large pot of water to a boil and salt it well; it should taste of the sea. While the water is heating, melt some butter or olive oil in a large saute pan set over medium-low heat. Add some minced garlic if you’d like. Don’t let the garlic brown, though. Boil the ravioli for 2 to 3 minutes, or about 90 seconds after they start to float to the top. Move them to the saute pan and toss to coat with the butter. Serve at once with freshly ground black pepper and grated pecorino or parmesan cheese. This looks so amazing and I’m super inspired by your site contents thus far… thank you for sharing and for writing these well-written, clear, easy-to-follow recipes!